Sun Coco Oil Roasted Potatoes - A recipe from Savor California, the online showcase for extraordinary gourmet foods and beverages from California. 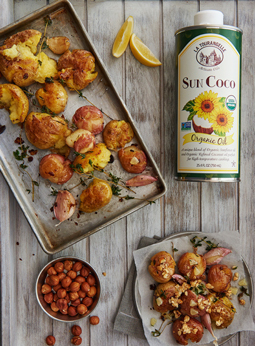 Sun Coco Roasted potatoes are delicate and rich in flavor thanks to the toasted hazelnuts and lemon zest. Put the potatoes in cold water in a pan with salt, crushed garlic and thyme. While potatoes are cooking, toast hazelnuts. Preheat oven to 350°F. In a baking pan toast hazelnuts in a single layer for 10 to 15 minutes. Take care not to over roast as nuts can scorch quickly. To remove skins, wrap warm hazelnuts in a dish towel and let them sit for 5 to 10 minutes. Rub vigorously in towel, discard skins. Once potatoes are cooked through, strain out potatoes, garlic cloves and thyme springs. Allow to drain and cool. Smash potatoes gently between your hands or lightly with a masher. In a medium saucepan, heat Sun Coco Oil. Add smashed potatoes, garlic and thyme. Season with salt and keep flipping sides until golden brown. Chop up toasted hazelnuts and place in a bowl. Add Roasted Hazelnut Oil and mix until all nuts are coated. Add in the lemon segments and salt. Take potatoes out of pan once browned, and place on a paper towel to drain excess oil. To plate, place the potatoes on a serving plate and spoon over hazelnut mixture. Garnish with lemon zest.